Finally it looks like our camping adventure is coming together. 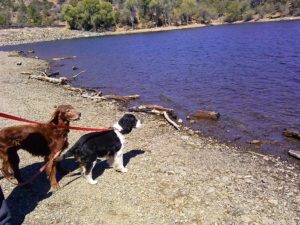 We chose Lynx Lake outside of Prescott AZ. The weather is mild during the day, clear and sunny with light breezes. It is chilly at night. Our first trip, we lost the roof of the tent to a wind storm. Finally found it and reattached. The second trip found a rattlesnake under the picnic table during the early evening. Third trip a different rattlesnake … well it had to be different snake now didn’t it since we were 100 some odd miles away … tried to get in the tent. Fourth trip it rained. Every. Single. Day and it snowed. So this last trip was a blessing. Our campsite is very private. No one on either side of us or in front. That’s because the site is about 125 yards from where the car can be parked. But no complaints about the extra walk or time it took traipsing back and forth from the car to the site. 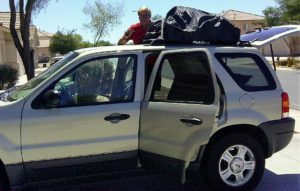 The luggage carrier worked out fine. No rattling or flapping. We have enough room to bring an extra small tent just for sleeping. When we start going cross country there will be days we’ll drive all day, camp for one night and take off again in the morning. It doesn’t make sense to setup the big tent, unpack everything then tear down 10 hours later. 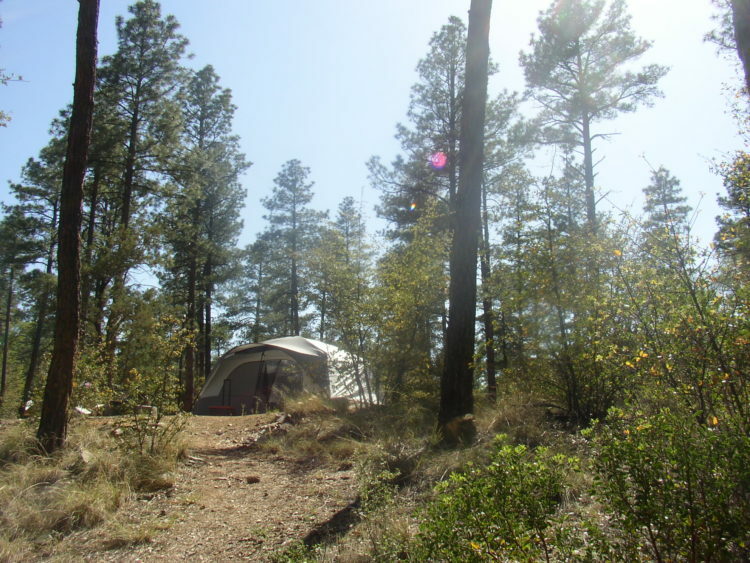 Lynx lake is in the Ponderosa Pines about 15 miles from the Historic District of Prescott. The campsites are flat but the terrain is gently slopping hills and valleys. Note to self: Do not wear flipflops to set up camp.